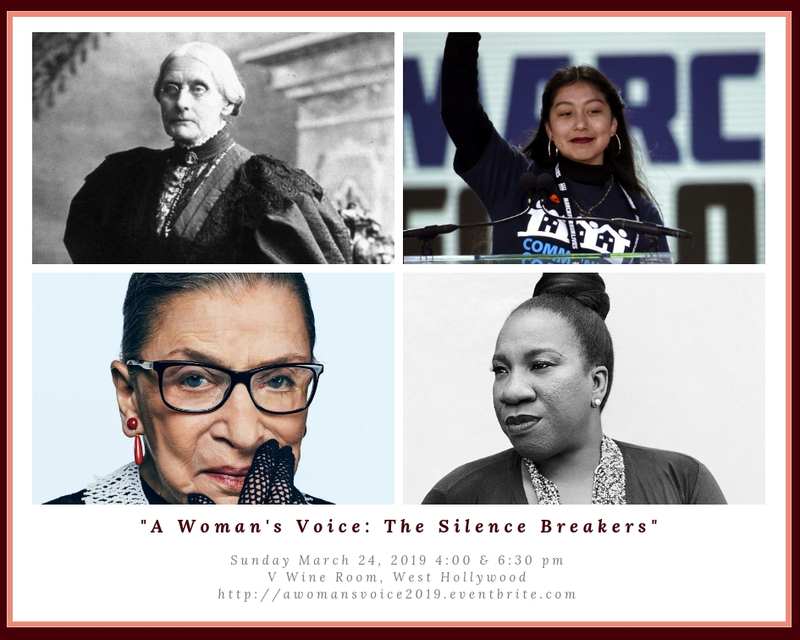 West Hollywood, CA - February 5, 2019 - Five Senses Tastings and the League of Women Voters of Los Angeles celebrate Women’s History Month with “A Woman’s Voice: The Silence Breakers,” a guided music, wine, and chocolate tasting event at V Wine Room located at 903 Westbourne Drive in West Hollywood on Sunday, March 24. The event will be presented at 4:00 p.m. and then again at 6:30 p.m. Live music from the classical, jazz, pop, and folk genres, among others, will be paired with each pour, while guests explore the lives of four iconic women: Susan B. Anthony, Edna Chavez, Tarana Burke, and Ruth Bader Ginsburg. Tickets ($60) can be purchased on Eventbrite https://silencebreakers.eventbrite.com and include four flights of boutique wines, handcrafted chocolates by Eos Chocolates, and live entertainment. “This event is an opportunity for the public to learn more about how women have given power and voice to the voiceless and disenfranchised and to hear more about our goals and programs for 2019,” said Marilu Guevara, executive director, League of Women Voters of Los Angeles. Proceeds from the event help the League of Women Voters of Los Angeles fund unbiased voter information guides, sponsor candidate forums and civic education programs. About League of Women Voters of Los Angeles: The League of Women Voters of Los Angeles is a nonpartisan political organization encouraging informed and active participation in government. For more information, visit www.lwvlosangeles.org and follow us on Instagram, Facebook and Twitter.